One of the most popular dogs in its home country of Finland, the Karelian Bear dog is used to keep bears away from human-inhabited areas of state parks in the United States. This breed is known for its intelligence, loyalty, and courage. The Karelian Bear dog is an ancient dog breed that shares its ancestry with the now-extinct Komi dog. Being an ancient dog breed, it has been difficult for experts to determine the specifics of the breed's origin. However, evidence suggests that the Karelian Bear dog may have originated in Northwestern Europe and used by Finnish and Russian farmers and hunters because of their hunting and watchdog skills. They continued to be bred to help hunt and bring down all sizes of animals including large species like bears, boars, elk, and moose. This breed is uncommon in the United States but is one of the top 10 most common breeds in Finland. In the United States, Karelian Bear dogs are being used by wildlife agencies, as well as state park and ranger services in Alaska, Colorado, Montana, Nevada, and Washington, as bear control. The Wind River Bear Institute, which aims to reduce human-caused bear mortality and conflicts worldwide, also utilizes Karelian Bear dogs to teach the bears to stay away from human populated areas. The dog is extremely smart and can communicate the type of animal it has located just by using a specific bark. The Karelian Bear dog is rare enough that it was placed into the American Kennel Club's Foundation Stock Service, which is a breed registry specifically for the documentation of rare breeds within the United States. Owners of rare breeds work to get the dogs recognized in the U.S. by logging the birth and parentage of each dog. The Karelian Bear dog has an all-weather coat that is short but dense. The Karelian Bear dog’s coat only requires minimal grooming, brushing the coat once to twice weekly to remove loose fur and prevent matting along with the occasional bath will keep your dog looking its best. As with other dog breeds, nails should be trimmed every three to four weeks as needed. Karelian Bear dogs are energetic, athletic, and have a tenacious work ethic, so daily exercise and providing them with jobs is extremely important. Their job does not necessarily have to be in the form of productive work but can include focused play. Fortunately, even without a bear to hunt or a farm to guard, there are plenty of opportunities to keep a working dog like this one busy, including puzzle toys, scent work, long exploratory walks, rally, agility, and training. This breed is intelligent, and when trained with consistency and patience, the dog learns quickly. Karelians respond well to positive reinforcement with toy and food rewards, a stable routine, and lots of love. Karelian Bear dogs were bred to be naturally aggressive to other animals for hunting purposes, which can result in this breed being suspicious toward other animals and strangers. Considering this aspect of their personalities, socialization starting at a young age is important. Annual vet visits will help your pet maintain optimum health and prevent and recognize any problems sooner. If you intend to buy a Karelian Bear Dog from a breeder, ask about any health tests given to the parents. The Karelian Bear dog should be fed high-quality dog food, whether commercially manufactured or home-prepared with your veterinarian’s supervision and approval. Any diet should be appropriate to the dog's age and activity level. Due to this breed being very active, consider a working or active breed formula to account for the dog's high-energy needs. Always make sure that they have clean and fresh water that's easily accessible and available. Check with your veterinarian if you have any questions or concerns about your dog's weight or diet. Karelian bear dogs are fairly easy to train because they are so intelligent. This breed has a protective nature and makes an excellent watchdog. Karelians do not have any breed-specific genetic health issues. Karelians are bred to be naturally aggressive, so they need a lot of socialization. The breed needs a lot of exercise to control their high energy level. Karelian Bear dogs are not suitable for apartment dwellers or people who are away from home most of the day. Karelian Bear dogs are not common in the United States, so they might be difficult to find. Check with the American Karelian Bear Dog Alliance to find a reputable breeder or rescue group in your area. 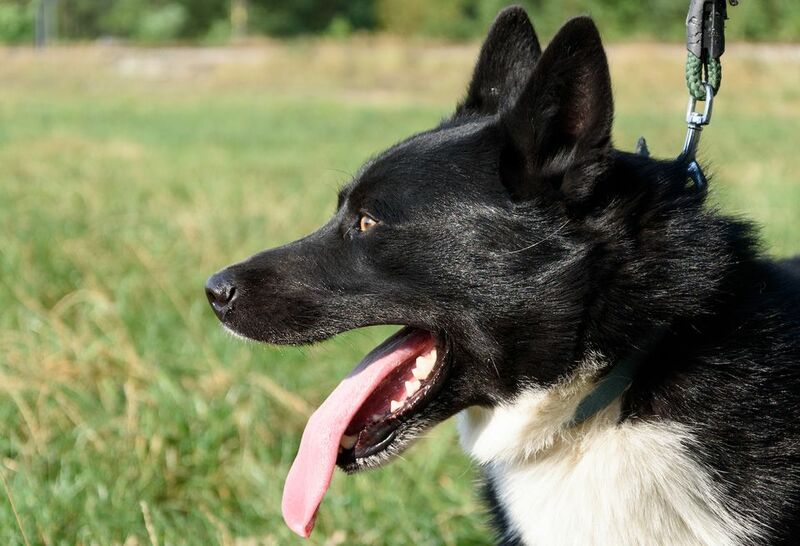 Is a Karelian Bear dog the right dog for you? Before you decide, be sure to do plenty of research and involve your entire family in the decision. Learning more about the breed helps set both your family and the dog up for success. After doing research, ask yourself, does my lifestyle correlate with this breed’s traits? Do I have the time in my schedule to provide the physical and mental exercise needs for this dog? Will this dog be a good fit for my family? Also, remember this breed may be difficult to find in the United States.